With just 23 games left to play, the Los Angeles Lakers find themselves on the outside of the playoff picture looking in. While this isn’t new for the Lakers, whose last playoff appearance was in 2013, this is new for LeBron James, who hasn’t missed the playoffs since 2006. A large part of LeBron’s legacy is his playoff consistency. James has made the playoffs each of the last 13 seasons and has been to eight straight NBA Finals while winning three of them. Just last season, LeBron averaged 34 points, nine assists and nine rebounds per game while shooting 54 percent from the floor and playing 42 minutes per game. In Game 1 of the finals against the Warriors, LeBron had 51 points, eight rebounds and eight assists in the losing effort (thanks a lot, JR Smith). And he did that at 33 years old. LeBron has been a playoff juggernaut all throughout his prime, which leads us to this question: If LeBron misses the playoffs this season, does that mark the end of his prime? It seems like a pretty steep drop from averaging 34-9-9 and playing 42 minutes every game while carrying a bad team to the finals at 33 years old to flat-out missing the playoffs at 34. But the signs are there. On Christmas against the Warriors, James suffered the only notable injury of his entire career. He missed 17 straight games, and 18 games total, due to a groin strain. While his averages in the games since he’s returned still measure up to his season’s averages, he has yet to eclipse 30 points in a game and looks noticeably less explosive on the court. It doesn’t seem that his groin is completely healed, but the Lakers need him on the court for the rest of the season while they fight for a playoff spot. The Lakers currently find themselves at 29-30, which is good for tenth in the Western Conference. Directly in front of them are No. 9 Kings by two games, and the seventh- and eighth-seeded Spurs and Clippers by three games. The Jazz also seem catchable in sixth place with just a four-game lead. I can’t see the Lakers catching the top five West teams, so the task the Lakers face is beating out two of the Kings, Spurs, Clippers and Jazz. After struggling to win the first half of the season, the Jazz seem to be hitting their stride since. They went 20-21 through the first 41 games and since have gone 13-5. They will need to keep up their good play if they wish to keep their playoff spot, as they have the strongest strength of schedule remaining ahead of them. 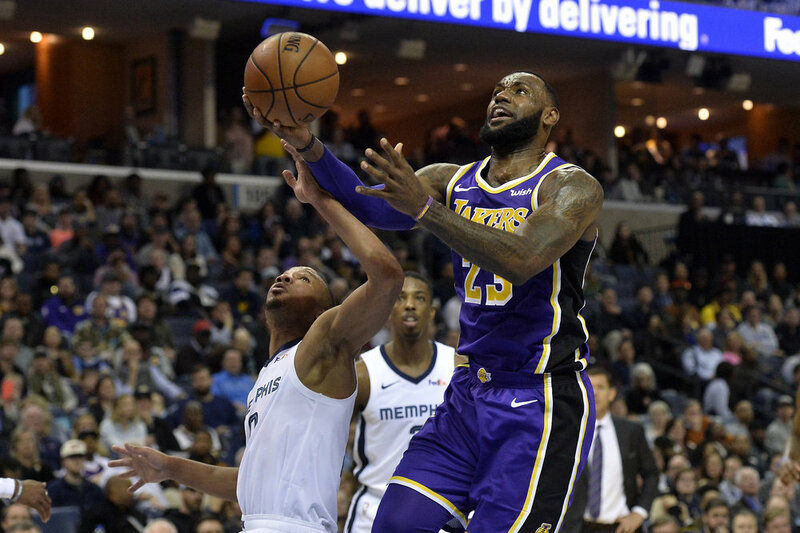 Even so, as a team trending upwards with Donovan Mitchell tapping back into his rookie year magic and Rudy Gobert healthy and playing All-NBA caliber defense at the rim, catching the Jazz would be an incredibly tall task for the Lakers. The Spurs, on the other hand, have hit a bit of a rough patch. They’ve lost six of their last seven games. Granted they’re on a long road trip against tough teams, their last loss was to the last-in-the-East, 12-48 Knicks. Unless they can turn it around, the Lakers might be coming for their playoff spot. Gregg Popovich may just find a way for San Antonio to keep their playoff streak alive. As impressive as LeBron’s 13-year playoff streak has been, the Spurs extended their streak to 21 seasons last year. Though this team far from resembles the Tim Duncan teams that Pop used to command, the duo of DeMar DeRozan and LaMarcus Aldridge, along with great shooters off of the bench, may be enough to keep their streak alive. I think the Clippers and Kings are far more likely for LeBron and company to catch than the Jazz or Spurs. The Clippers played the role of sellers at the trade deadline by sending the bromance of Tobias Harris and Boban Marjanovic to the city of brotherly love (how fitting). They haven’t played many games since the deadline but have gone 3-3 since moving the duo. It’s hard to imagine that this team will win enough to retain a playoff spot without two major cogs in their machine. Harris was the team’s leading scorer before the trade, so the Clippers will have to go to the likes of Lou Williams and Danilo Gallinari for points. With the two LA teams having two key matchups remaining this season, I can see the Lakers catching the Clippers and booting them from the playoff picture. Nobody expected the Kings to be playing this well. When the Celtics acquired the Kings’ 2019 first round pick from the 76ers before the 2017 draft, many people thought the pick would fall somewhere around the top five. Well, this season the Kings went out and shocked everybody, and much of this is because of the leap De’Aaron Fox has made during his sophomore season. The fifth pick from the 2017 draft is averaging 17 points and seven assists this season, and has taken on a leadership role at just 21 years old. Buddy Hield has been another nice surprise for Sacramento. He’s averaging over 20 points per game and is shooting nearly 45 percent from deep. This dynamic duo gives Sacramento one of the deadliest young backcourts in the league. Throw in the second pick from last year’s draft, Marvin Bagley III, and the Kings have a potentially dangerous and young big three. While deadly on offense, the Kings struggle on the other end of the floor. The Kings surrender the fifth most points per game in the NBA. Only the Pelicans, Suns, Wizards and Hawks allow more. Even the Knicks, who are “tanking for Zion,” have a stingerier defense than the Kings. I find it hard to believe that Sactown can find a way into the playoff picture without playing a lick of defense, especially considering that they have the fifth hardest strength of schedule remaining. It doesn’t matter how good or bad the teams ahead of the Lakers play for the rest of the season if the Lakers can’t find a way to play well themselves. They went 6-12 in LeBron’s absence, looking clueless as to how to play without him. However, they are only 3-4 since his return, losing to the likes of the Pelicans and the Hawks. It isn’t up to Kyle Kuzma or Brandon Ingram or Lonzo Ball to save the Lakers. Those guys think they’re disposable after the Anthony Davis trade deadline fiasco. It’s completely on LeBron James’s shoulders to take the Lakers and carry them into the playoffs to keep his playoff streak alive. Otherwise, the whispers on LeBron being over the hill will grow louder. So, let’s see if LeBron has another “playoff mode” left in him.